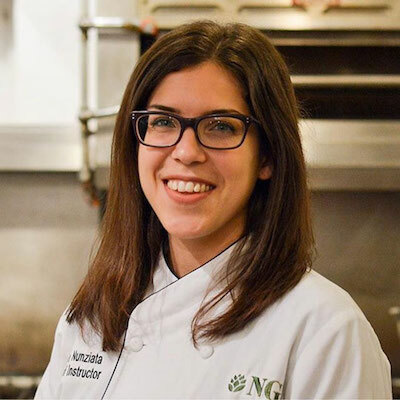 Ann Nunziata is a graduate of NGI’s Chef’s Training Program and has a background in nutritional sciences. She has cooked in award-winning plant-based kitchens including Millennium Restaurant, the Omega Institute, and Ravens Restaurant, where she became known for her temptatious vegan Tea Time desserts. Ann is a chef instructor in the Natural Gourmet Institute’s Chef’s Training Program. She also cooks with Union Square Greenmarket, First Descents, and Wellness In The Schools. Her favorite spice is nutmeg and she keeps her Instagram account well-fed at @AnnZiata.